Scary Terry's World: MARS ATTACKS POPEYE! 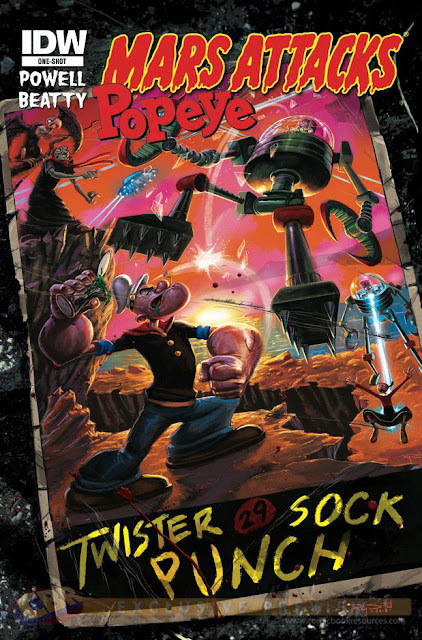 IDW's one-shot cross-over comic MARS ATTACKS POPEYE hit the comic shop shelves yesterday, and by all accounts, is selling out all over the country. Written by my pal Martin Powell, with art, letters and color by me, this project was a dream for both of us. The two of us are life long Popeye fanatics and didn't think we'd ever have a shot at working on a Popeye comic -- but this came our way and we're thrilled with the results. Thanks to all the folks at IDW for letting us run with this and doing it our way. Below is the front cover by Ray Dillon -- and the splash page, drawn by me. What a treat to get to draw all those classic Segar characters -- in the classic Segar style! Of course, there's no way I could ever fill the master's shoes -- but it sure was fun stumbling around in them for a while. Reviews and public response have been overwhelmingly positive -- and Martin and I hope this will lead to more Popeye work for us -- but of course that's up to the editors at IDW. Time will tell. And here's proof of my long-running Popeye obsession. 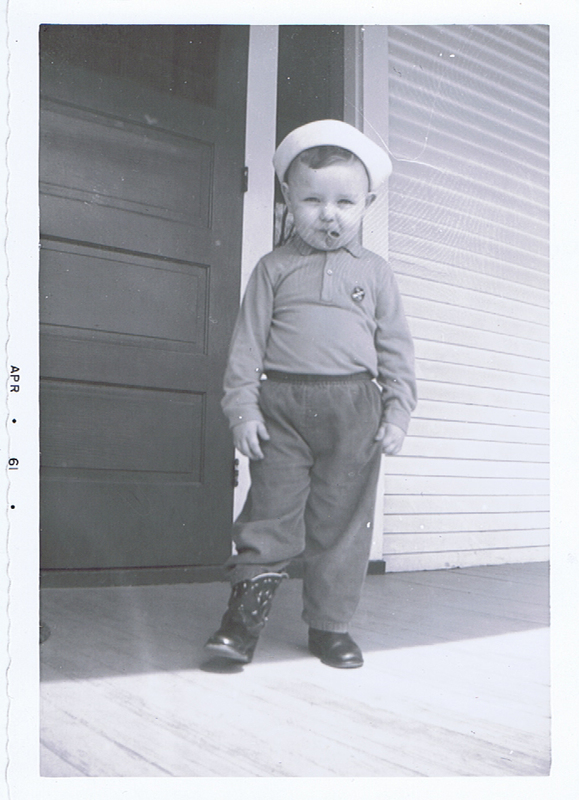 That's me, on the front porch of the old homestead, at age three, with sailor cap, pipe and Popeye pinback button. Even in cowboy boots, I'm playing Popeye here. I yam what I yam! 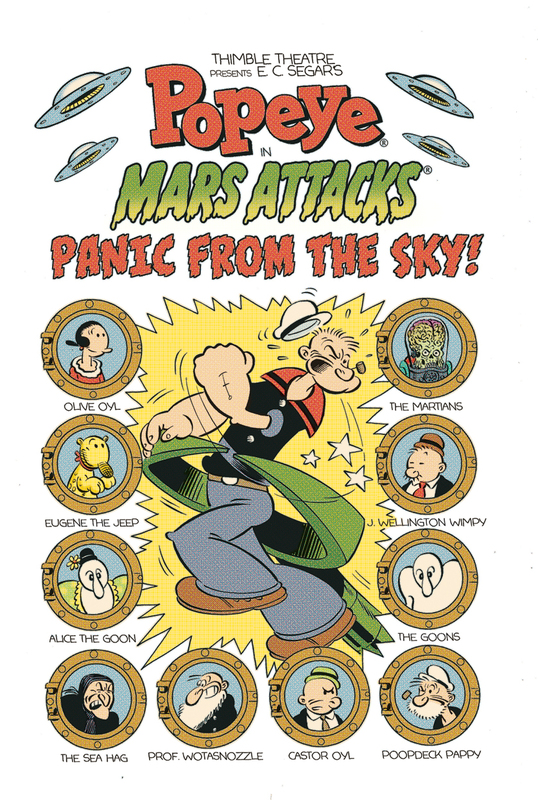 My son's been reading Segar's Popeye lately, and he gave me a Mars Attacks plush for Christmas ("Because I know how much you love Mars Attacks," he wrote on the note). We're both looking forward to reading this one. I called my local comic shop today and they set aside their last copy for me to pick up tomorrow.